It’s cold. Average January to February winter temperatures in the Arctic above 800N latitude are about -300C – which means it occasionally gets colder than that. As I sit writing this on January 6, 2012, it is -180C at Alert, Canada, the world’s northern-most weather station. You can find the current temperatures around the Arctic (whatever day you’re reading this) at this fantastic interactive Athropolis weather map. It’s dark. Most people are aware that it’s cold during an Arctic winter but often forget about the fact that at 800N and above, the sun does not rise above the horizon from the middle of October until the end of February, which means dusk-like conditions are the most “daylight” that exists for more than four months. Depending on where a polar bear is spending the winter (north or south of 800), the number of sunless days will vary. 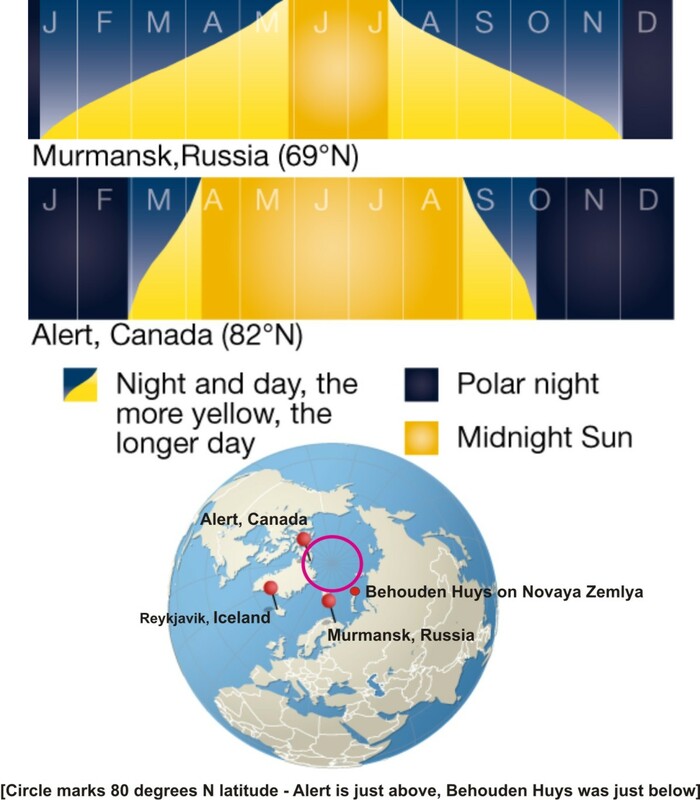 For example, locations just north of the Arctic Circle (the point above which this phenomenon occurs), such as Murmansk in Russia, have a relatively short “winter’s night” of only one month (see Fig. 3 below, modified from this poster). Figure 3. Daylight variation in the Arctic near 800N (magenta circle). Behouden Huys, the over-winter home of Barents and his crew in 1596-97 on Novaya Zemlya was located at 760 12’N. It had a “winter’s night” of 3 months (early November – early February) – about a month shorter than that experienced at Alert and twice as long as at Murmansk. Modified from a poster by Hugo Ahlenius, UNEP/GRID-Arendal 2008. The geographic position of Behouden Huys meant it had about three months of darkness, from early November through early February. The insight into polar bear winter activities comes from the marked lull in polar bear sightings and attacks experienced by Barents and his crew during this period. The 4 of November it was calm weather, but then we saw the sun no more, for it was no longer above the horizon…The same day we took a white [arctic] fox…the bears left us at the setting of the sun, and came not again before it rose [in the spring], the fox[es] to the contrary came abroad when they [the bears] were gone. This suggests that during the darkest days of the Arctic winter, the polar bears in the vicinity of northern Novaya Zemlya were inactive. But was it the dark – or was it the cold? While it was cold with intermittent storms through November, it was generally fair enough for the men to be outdoors on many occasions. They even went to the ship during November and saw no bears. It was not until December that De Veer noted massive storms coming one after the other, with lots of snow and howling wind. During this depth of winter (December to early January), even when the storms died down it was even more bitterly cold than it had been in November. They did go outside whenever there was a short break in the weather, however – to get more firewood and to collect Arctic foxes from the traps they had set (the foxes seemed not to mind the dark or the cold: the crew were able to trap foxes all winter and used the furs for hats and consumed the meat, which they apparently relished). 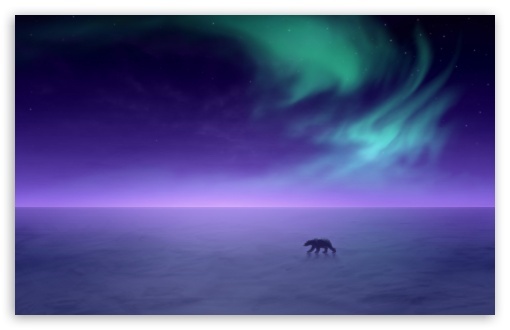 After a harrowing encounter with three bears on the 26th of October (as they moved the last of their belongings off the ship), the men did not see another bear until Jan. 31, almost a week after they famously saw an illusion of the sun rising above the horizon. The timing of this hiatus of polar bears – in relation to the extent of storms and cold experienced at this location – suggests that they reduced their activities due to the darkness, not the cold. about noon there came a bear towards our house, and we watched her with our muskets, but she came not so near that we could reach her. The same night we heard some foxes stirring, which since the bears began to come abroad again we had not much seen. at least one hundred pounds of fat out of her belly, which we melted and burnt in our lamp…for by that means we still kept [could keep?] a lamp burning all night long, which before we could not do for want of grease…. we had more light in our house by burning of lamps, whereby we had means to pass the time away by reading and other exercises, which before (when we could not distinguish day from night by reason of the darkness, and had not lamps continually burning) we could not do. …the same day [Feb. 17] five of us went to the ship to see how it lay, which we found in the same state as before; there we found foot-steps of many bears, as though they had taken it up for their lodging when we had forsaken it. (pg. 156). On the 23rd of February, they collected their last foxes from the dead-fall traps. After this date, De Veer makes no further mention of foxes but by the sounds of it, polar bears had returned with a vengeance. 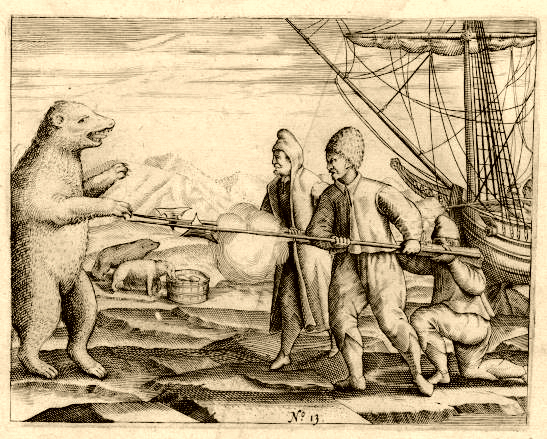 Barents’ crew continued to have as much trouble with bears over the spring and early summer of 1597 as they had had during the early part of their stay. With the notable exception of that dead-of-winter break (Nov. 4 to Jan. 31), bears watched and stalked them continuously from mid-Sept. until the day before they left on Jun. 13 (see summary below). 29 Sept. stalked by three bears (two were cubs), chased them off. In summary, Barents and his crew saw or heard no bears from November 4 until January 31, almost exactly the period when the sun was below the horizon – with much activity both before and after. This hiatus of polar bear activity around Behouden Huys did not correlate with the period of most intense storms and cold. The experiences of these men – chronicled by De Veer more than 400 years ago – suggests that polar bears may spend the darkest part of the winter curled up in a sheltered spot rather than out and about looking for food. In my next post, I’ll examine the evidence that polar bear biologists and hunters have to offer regarding the question of what polar bears do during the cold and dark of an Arctic winter. This entry was posted in Life History, Polar bear attacks and tagged Arctic darkness, Arctic winter, Barents, Behouden Huys, daylight, De Veer, Novaya Zemlya, polar bears in winter. Bookmark the permalink.